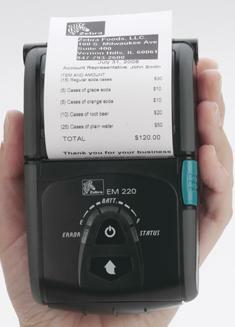 Perfect for price-sensitive customers that need to print 2" receipts for payments and other types of transactions. And, it is small enough to fit in your pocket, making it effortless to wear or carry, especially during extended periods of time. The magnetic card reader enables users to accept credit cards at the point of service and within the customer's sight. The EM220 works great for receipt or ticket printing applications: onboard transportation ticketing, receipt printing for events, amusement parks, concessions, gas stations and parking lots, direct store delivery, proof of delivery/payment, and receipts for repairs or installations. EM220 DT 2.28" 2.28" 203 3 IPS 1.57" .69"